Dimensions (HxWxD): 1" x .75" x 0.55"
This Besednice Moldavite Starburst Specimen has a concise, elegant and coherent form. Energetically powerful, it has good translucence even though it is so thick and has deep green color. This is a 29.6 carat, 1 inch long museum grade AAA specimen of natural moldavite from the Czech Republic, which we obtained from the collection of Robert Simmons of Heaven & Earth and comes complete with a certificate of authenticity from Robert himself. 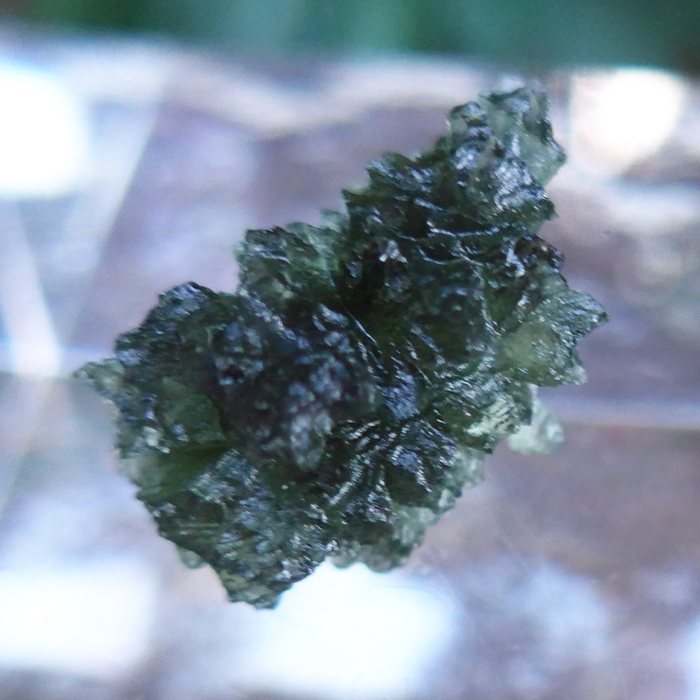 Like other good Moldavite specimens it has a complex irregular surface and a biomorphic form, which indicates the outer space origins of this amazing gemstone, which liquefied upon impact with the Earth, forming the unique surface irregularities and distinctive starburst shape that characterize this gemstone's present form. Moldavite is a rare bottle-green translucent stone of unearthly origins, more rare than diamonds, rubies or sapphires. The clay pits of Besednice, Czech Republic are the only source in the world for the world's most desirable flavor of Moldavite. 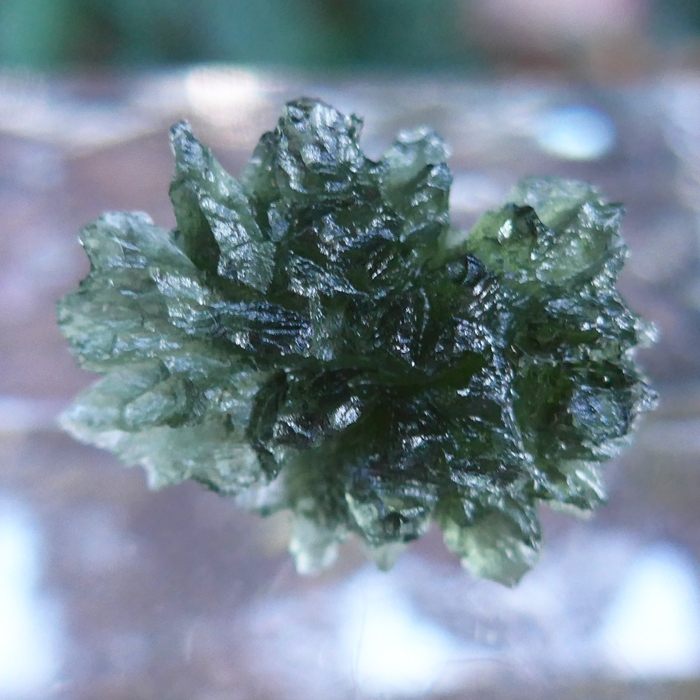 Mineral collectors and Lightworkers agree that this is the highest grade of Moldavite, extremely rare on today's market and increasing in value every year. Like other Besednice specimens this beautiful serrated Moldavite Starburst Specimen has a complex surface, with lacy folds and grooves that give it a starburst appearance. It is the perfect size to hold in the hand during meditation or for display on an altar or tabletop. In his book Moldavites: The Czech Tektites, Professor Vladimir Bouska states that "The first human being that was interested in Moldavites was a Cro-Magnon man from the aurignacian age, i.e., the Upper Paleolithic. Several potsherds [fragments] of green Moldavite glass were found together with the famous statue of Venus of Willendorf, which is about 29,000 years old, at Willendorf in Lower Austria." Moldavite is known as the "Grail Stone". Legends say that the Holy Grail was formed out of a green stone that fell from Lucifer's crown as he descended from his heavenly abode to Hell, impelled by the force of a blow from the sword of Michael the Archangel. Until recently it was assumed the Grail Stone was emerald, but recently metaphysical rockhounds have suggested that the true Grail Stone is moldavite, a translucent green gemstone that fell from the sky millions of years ago. Metaphysical rockhounds and crystal healers say that moldavite activates any and all of the chakras and also opens the mind to the limitless possibilities inherent in its cosmic origins. Moldavite's energy tends to dissipate blocks throughout the energy system and then center energy in the heart, opening the heart to universal love. 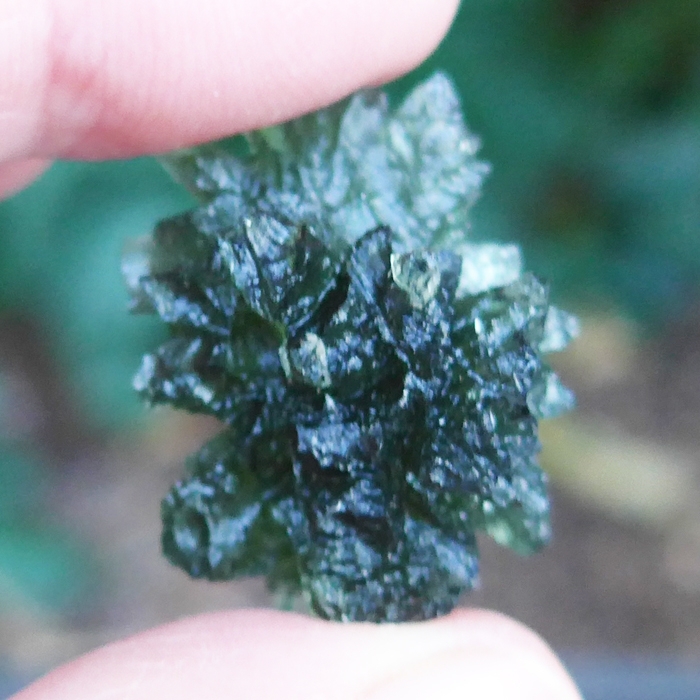 If you want change in your life, Moldavite can expedite that change, connecting you to Source & your own Divinity. From personal experience during meditation with Moldavite, I can tell you that much depends upon intent. When my intent has been to quiet the mind, holding one of these crystals reduces mental chatter to virtually nothing, while stimulating the crown chakra, the third eye & the eighth chakra above the crown, creating a feeling of warmth & depth, a buzzing and a tingling on the crown of the head and between the eyebrows. There was a physical awareness of a tremendous flows of energy carried on the inbreath and outbreath from the eighth chakra and higher, spiritual sources, through these vital centers and deep into the body. Note: Weight above is shipping weight. Net weight is 5.92 grams or 29.6 carat weight.